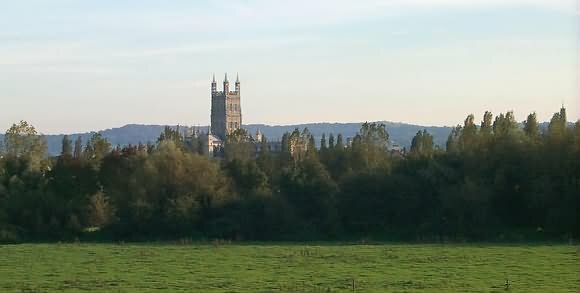 Gloucestershire splits into three areas, major part of the Cotswolds, the Royal Forest of Dean and the Severn Vale with a total population of 565,000. Gloucestershire lies on the northern edge of the South-West of England, famous for the many beautiful Cotswold towns and villages such as Bourton-on-the-Water, Cheltenham, Stow-on-the-Wold, Tewkesbury, and The Slaughters. Filled with outstanding picturesque views across the River Severn and simply amazing scenic Countryside settings. Gloucestershire has so much to offer and just some of its nearby attractions include the 840 year old 'Berkley Castle', the Ruins of 'Witcombe Roman Villa' and 'Tewkesbury Abbey' which is over 500 years old and has the tallest Norman tower in England. The easiest airport for travelling to Gloucestershire & the Cotswolds is Birmingham, a 1 hour drive away. Of the two London airports the region is best accessed from Heathrow. The 65 mile drive should not take more than 90 minutes. Gatwick airport is 2 hours drive away. The M4 and M40 provide easy access to Gloucestershire & the Cotswolds from London and the South East. The M5 is a direct link to Birmingham, England's North Country and the Counties of Devon and Cornwall. Another way to explore Gloucestershire is by car, there are many car rental companies to choose from to give you the freedom to explore at your own pace. The National Express network runs bus travel throughout England. It offers a rage of discount fares and trail passes. The main route to Gloucestershire & the Cotswolds from London starts at Victoria Coach Station. The main bus stations in Gloucestershire & the Cotswolds are at Cheltenham, Gloucester and Stroud. Gloucestershire & the Cotswolds are at the heart of the British Rail network with main line routes to London, the Midlands and the North and the South West of England. There is a direct link from Heathrow Airport. Trains from London depart from Paddington Station and have a fastest journey time of 1hr 40 minutes to Gloucester and 2 hours to Cheltenham. There is a direct link from Birmingham Airport with a fastest journey time of 1hr 15 minutes to Cheltenham and 1 hr 30 minutes to Gloucester. In Gloucestershire & The Cotswolds there are main line railway stations at Cam and Dursley, Cheltenham, Gloucester, Kemble (serving Cirencester), Moreton-in-Marsh, Stonehouse and Stroud. Visitors including the county as part of a rail based holiday are recommended to plan accommodation within easy reach of these stations. 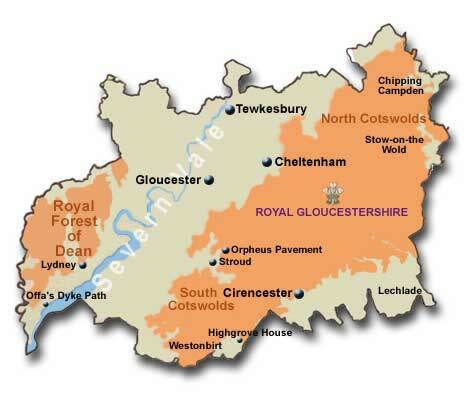 The English county of Gloucestershire forms the greater part of the Cotswolds region but the other English Counties of Worcestershire, Warwickshire, Oxfordshire, Wiltshire and Somerset also contain parts; an area once given over entirely to sheep-farming. Many of the fine churches and manor houses owe their existence to the generosity of the wealthy medieval yeoman farmers and wool merchants. The dignified villages and towns owe much of their charm from the use of the warm, honey-coloured limestone which was locally quarried by hand and used alike for humble weavers cottages, mansions, and churches. Never far from sight, numerous streams wind through the valleys and chatter alongside main streets. Nestling between the Wye Valley, the Vale of Leadon and the Severn Valley, the Royal Forest of Dean is one of England's few remaining ancient forests, covering 27,000 acres of woodland. Designated as a National Forest Park in 1938, this ‘Queen of Forests' boasts a spectacular range of natural beauty combined with an aura of magic and mystery that has been the inspiration for many great artists and writers including Tolkien and JK Rowling. In the Severn Vale lush meadows lie alongside the lower reaches of Britain's longest river, famous for its tidal bore. Half-timbered, black and white buildings are in evidence and the curious solitude of the widening estuary is a haven for thousands of wildfowl and wading birds. Find out about the ninety gardens in Gloucestershire that are open to the public under the Gloucestershire National Gardens Scheme. 'I remember, too, the light on the slopes, long shadows in tufts and hollows, with cattle, brilliant as painted china, treading their echoing shapes' Cider With Rosie is a wonderfully vivid memoir of Laurie Lee's childhood and youth in a remote Cotswold village. From the moment he is set down in the long grass, 'thick as a forest and alive with grasshoppers', he depicts a world that is both tangibly real yet belonging to a now distant past. THE Daffodil Way in the Leadon Valley, on the border of Gloucestershire and Herefordshire, attracts thousands of walkers in March and April There are few places in Britain where you can see flowers growing in the wild in such profusion. Best in bloom: The daffodils have naturalised in grass in the fields, and there are also thick clusters of them in Dymock Wood. In places there is noise from the M50 motorway but most of the Daffodil Way is gloriously tranquil. The route also passes through pretty apple orchards. And there's more: The attractive village of Dymock has a lovely church with an exhibition about the 'Dymock Poets' who included Rupert Brooke an Robert Frost. During the daffodil season, teas are often served in to church. Which weekend to go: 1st and 2nd weekend in April . How do I get there? The Daffodil Way can be accessed from several places - park in Dymock or in the Forestry Commission car park at Queen's Wood south of Kempley Green. Where to stay: See accommodation at Tewkesbury and Gloucester.